Just Property Potchefstroom opened its doors on 1 October 2004 in a small office in the central part of Potchefstroom. Since that humble beginning, the office moved during August 2007 to the premises where are still situated at 29 Peter Mokaba Street, which is ideally situated and easily accessible from the central part of town, as well as the North West University. The staff consist of an administration department, office manager and six letting agents. Potchefstroom is an academic city in the North West Province of South Africa. It hosts the Potchefstroom Campus of the North-West University, and is situated on the banks of the Mooiriver, roughly 120 km west-southwest of Johannesburg. Potchefstroom is home to, inter alia, five tertiary institutions and 30 schools, as well as numerous research bureaus and training centres, including The North-West University, The Potchefstroom College of Education, The Technical College Potchefstroom, The Agricultural Centre, CTI Education Group, Potchefstroom Akademie, The Hair Academy of South Africa, as well as several primary and secondary schools. Potchefstroom is known as the North-West Province's "Home of Sport", the provincial headquarters of 17 of the most important sports are situated in the city. The city has become the home away from home to many international athletes and teams, as it is the only place in the world with a perfect balance between altitude training and quality training at 1400m. Athletes and professional sports teams train at the HPI (High Performance Institute of Sport) of the North West University. There is also the Fanie du Toit Sports Grounds located on the North West University, and the Kenneth McArthur Stadium, which is the local athletics stadium. Other places of interest include The North-West University Botanical Garden, MooiRivier Mall, a shopping mall opened early in 2008 with over 100 stores, Dome Bergland Nature Park, site of a meteorite impact, Boskop Dam Nature Reserve, Potchefstroom Museum, OPM Prozesky Bird Sanctuary, Buffelsvlei Wild Animal Park. With the company's re-brand to one unified company around 2 years ago, we have evolved from being only a specialist letting agency, to a fully integrated real estate business offering a complete property solution that includes residential letting and property sales. This bold step has also enabled us to one again be a market leader in wealth creation, through our financial wellness program called Your Property Journey, whereby we are able to guide tenants towards becoming homeowners. Potchefstroom as a city has also seen very steady growth in especially the property investment sector, and as such opens itself to first time buyers entering the market, as well as current investors looking to enlarge their portfolio. Although we place a large emphasis on technology to continuously enhance and streamline our client's experience with us, we are ever passionate about giving our clients the most professional and personalized service possible, never losing touch with the customer. We make use of sophisticated software in order to ensure that both tenants and landlords alike enjoy the benefits of our automated rental payment platform, as well the comfort and efficacy of all our online marketing platforms. Although we are situated in a market which consists largely of student accommodation, we are by no means limited and have a myriad of properties available right across the spectrum. 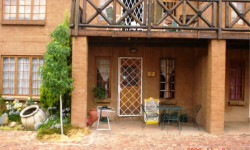 29 Peter Mokaba Street, Potchefstroom, North West, 2531.